In the pecking order of granola bars, Nature Valley is right up my alley. Their products are generally tasty enough for me, while covering their bases in terms of fairly healthy ingredients. The price is usually pretty low as well. You could contrast them with a couple other extremes. You could go ghetto granola bar and get the Sunbelt brand. These are generally right next to Little Debbie snacks in the grocery store. That should be your first clue to stay away. I'm not a granola bar racist, so I bought the combo pack which contains both vanilla and strawberry yogurt bars. As a completely straight hetero-sexual man, I can honestly say that I have a nut fetish. I love nuts in my granola/fruit bars. They give a satisfying crunch and add a more meaty flavor to the bar, and contrast the usually sweet flavors. Sadly, these yogurt bars were devoid of any type of contrasting textures. It's straight chewy granola here. While I can deal with this, I quickly ran into the Achilles heel of these granola bars--the Yogurt. When I eat yogurt, I expect a bit of "tart-ness" to mix with the sweet flavor. I realize that yogurt is really just spoiled milk, and I'm OK with that. In fact, I was kind of expecting the yogurt on these granola bars to be a little tart. WRONG. It's as if they took some quasi-yogurt-esque base and mixed it with the same coating they use on iced animal cookies. You know the coating--they take equal parts karo syrup and wax, melt, and then drape over the animal cookies and top gratuitously with small candy balls. Your grandma probably had these on hand all the time at her house. 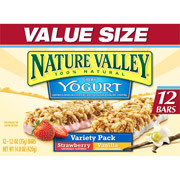 That's what I tasted while eating these yogurt granola bars. I forced my way through both flavors, finding each bite more sweet than the last. It was bordering on disgusting. I realize that some people may love the sugary taste the yogurt gives. I know that when I bite into a snickers bar, I'll get a mouth-watering burst of sugary ingredients that are terrible for my health. I know this. I didn't expect or want a chewy sugar bomb when eating this granola bar. Krispy Kremes dipped in chocolate milk. I gave the remainder of these granola bars to my kids. I couldn't eat them anymore. I may have to take out a personal loan in order to start buying Kashi bars. 1 marshmellowy star out of 5.